Catch the Formula DRIFT champ on KROQ’s Loveline tonight. If you’re in the Los Angeles area tune in to 106.7 FM. 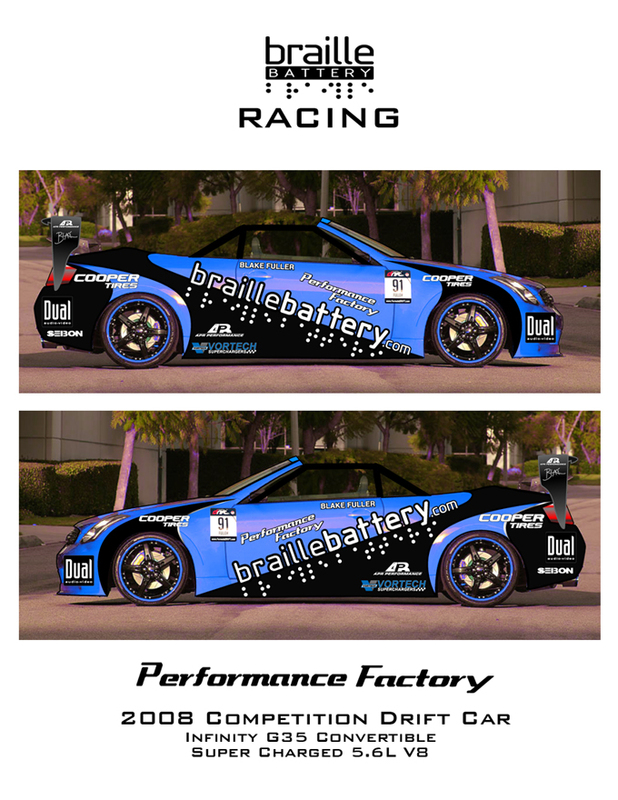 Blake Fuller and Braille Battery has recently unveiled his new Infiniti G35 that will be ready for competition by the end of the season according to Fuller. An official press release will be sent out shortly by Fuller and will be posted on the Formula DRIFT website. Stay tuned for more. 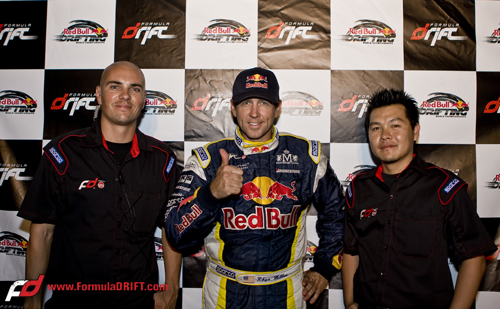 Long Beach, Calif. – July 15, 2008 – Formula DRIFT entered Las Vegas Motor Speedway for the first time for Round 4: High Stakes and rookie Toshiki Yoshioka took home the victory. This event also marked the 2nd event of the Tires.com Triple Crown bonus prize with Rhys Millen holding the lead over teammate Daijiro Yoshihara. Entering Las Vegas Motor Speedway for the first time the Formula DRIFT Championship came back to the West Coast. The course became the fastest on the circuit with multiple drivers topping the high 90 mph range with their initial drift through the challenging track. The competition was as tough as ever with many new faces and vehicles entering the competition. The event showcased one of the most diverse fields in Formula DRIFT history with the world’s best drivers from around the world participating at the event. Drivers such as Toshiki Yoshioka from Japan, Christian Pickering from Australia, JT Wharerau from New Zealand, and world renowned Japanese champion Manabu Orido made his Formula DRIFT debut. Japan came out on top with both Daijiro Yoshihara in his Bridgestone / RMR Pontiac Solstice GXP and Toshiki Yoshioka in his ASpec / Works Bell Toyota Sprinter Trueno making it to the finals. 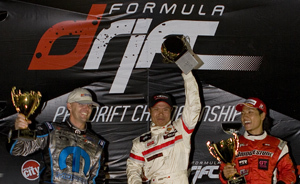 After a hard fought battle, Formula DRIFT rookie, Toshiki Yoshioka took home top honors in only his 2nd Formula DRIFT appearance. At the halfway point of the season the competition for the Castrol SYNTEC Power Cup is as tight as ever with 2007 Formula DRIFT Champion Tanner Foust and his Rockstar / AEM Nissan 350Z leading the way and with less than 15 points separating Foust from 2-time Formula DRIFT champion Samuel Hubinette in his Nuformz Racing / Mopar Dodge Viper SRT10 in 2nd place and contender Daijiro Yoshihara in his Bridgestone / RMR Pontiac GTO following in 3rd, it will be a hard fought battle to the end. 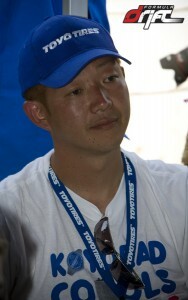 This event also marked the 2nd event for the Tires.com Triple Crown bonus prize and previous winner Rhys Millen leads the way by 4 points over teammate Daijiro Yoshihara. Formula DRIFT action continues on August 9 at the Evergreen Speedway in Monroe, WA. LONG BEACH, Calif. – July 11, 2008 – Formula DRIFT, North America’s premier drifting Sanctioning Body, has partnered with Red Bull Energy Drink, the world’s leading energy drink, to create one of the world’s most anticipated drifting events ever – the Red Bull Drifting World Championship. The event, which will feature 32 of the world’s best drifters, will be held on the docks at the Port of Long Beach, Calif., on Saturday, November 15, 2008. The Red Bull Drifting World Championship will bring the best drifting drivers in the world together to compete in a single historic event. Drivers from the United States, Japan, Australia, New Zealand, Malaysia, Singapore, Europe and Canada will participate, but only one will claim the title of Red Bull Drifting World Champion. Current and past champions from the world’s top professional drifting series will receive an exclusive invitation to showcase their skills and compete for the largest drifting prize purse ever offered. “Formula DRIFT has worked over the last five years to bring the drifting world closer together via our partnered events in Singapore and Mexico as well as our open door/open dialogue with the top professional drifting leagues from each corner of the world. We are excited to be able to team up with Red Bull to bring the world together and stage the toughest competition with the best drivers,” stated Jim Liaw, President/Co-Founder of Formula DRIFT. Formula DRIFT, North America’s professional drifting championship series, will play the role of organizer, co-promoter, and sanctioning body for the World Championship event. Judging will be based on current Formula DRIFT rules and regulations with the possible addition of two international judges.